Answers such as customer, order, sales, owner, manager, product etc are acceptable. The Relationship shows the position of the keys within the entity. It is usually called a One-to-Many relationship; hence the single element at the left and the multiple elements at the right end of the symbol. 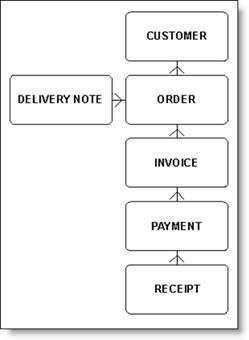 For example, take the section of the diagram showing the relationship between customer and order. From this we can state that 'one Customer makes many Orders', or, in fact, 'many orders are made by a customer'. This diagram also tells us that the order entity contains the prime key of the customer entity (verify this from the entity descriptions above). When we see a crow's foot attached to an entity we can see that this entity contains the key of the entity at the other end of the symbol.